a 1 day cruise to Freeport, Bahamas, from Cruise Port Everglades. South Florida is a great place to visit and even better to live, and one of the many things that makes it even greater is the proximity to many tropical and sub-tropical islands. Parking is $15 per day in the City of Fort Lauderdale Public Garage. 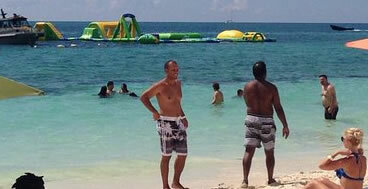 You will be able to enjoy Grand Bahama Island for about 4 1/2 to 5 1/2 hours depending on when you leave the ship. Each adult passenger is allowed two carry on items. Maximum Dimensions are 22 inches x 18 inches x 10 inches, maximum weight: 26.5 Ib / 12 kg, any luggage item exceeding these dimensions is required to be checked in at the cost of $25.00 USD. 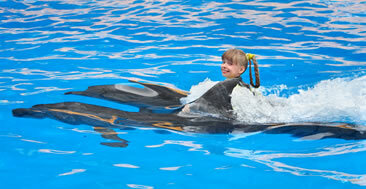 Grand Bahama Island is 1 of the two Largest Bahamas Islands with many resorts and things to do. Grand Bahama Island, ask out agents for reliable Island transportation. Grand Bahama home to the cities of Freeport and Lucaya, with a relaxed pace and a more casual atmosphere than the Old World sophistication of Nassau. You will enjoy a wide range of duty-free shopping that includes some of the finest names in fashion, crystal, jewelry, silver and china. And there's local art and crafts too. You will find your choice of dining stimulation, from the most sophisticated gourmet dining to fresh fish at native restaurants. There are numerous attractions to visit, a casino, swim with the dolphins, and exciting nightlife on Grand Bahama Island. Freeport / Lucaya is also a sports lover's paradise, with multiple championship golf courses, tennis, scuba diving, snorkeling and fishing. And there's a lot more to Grand Bahama than the main tourist areas of Freeport/Lucaya. You can explore an entire island surrounded by beautiful beaches with pristine waters, natural wonders including one of the world's largest underwater cave systems, three national parks, and small settlements nestled throughout the island. Miami to Bimini, Bahamas cruise for 1 day. It costs you more to stay home than to cruise and party with us. Your 1 day or two night cruise to Bimini, Bahamas, starts in Miami by boarding the Bimini Shuttle cruise ship. With top speeds of about 38 knots per hour, It's the fastest cruise to the Bahamas, it make crossing the Gulf Stream with a comfortable journey from Miami Florida to Bimini, Bahamas. The service staff makes you feel like a VIP. Remember, you can Cruise to Stay on the tropical Island of Bimini, Bahamas. 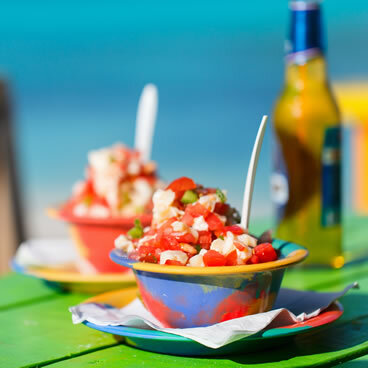 Plenty of relaxing or active things to do on Bimini Island, Bahamas. This island gave inspiration to Ernest Hemingway so much so he wrote "Islands in the Stream"
With World-Class Service from international crews, you will have a memorable experience in our restaurants, bars and other facilities on the ship. The Miami Casino and Resorts World Casino- Whether you're playing out at sea or ashore, you'll experience world-class casino gaming with live action table gaming, the hottest slot machines and a sports book to bet on all your favorite teams! Cabins are available for as little as $125 pp* when you book prior to sailing. *If Purchasing Cruises Day Of Sail, Must Report to Terminal 2 hours before departure to ensure confirmation. $25 fee for each piece of checked luggage. 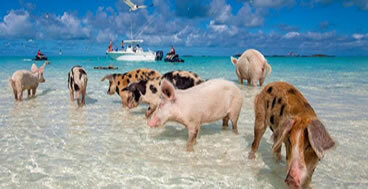 So many things to do in the Bahamas, including Swim with the dolphins and pigs.